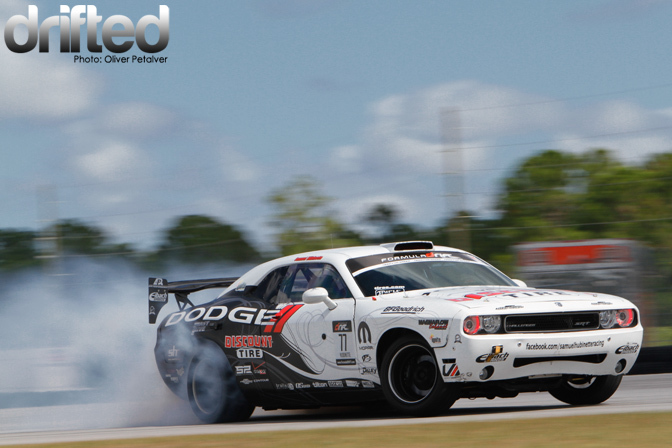 For the first time in Florida, Palm Beach International Raceway was host to Formula DRIFT. 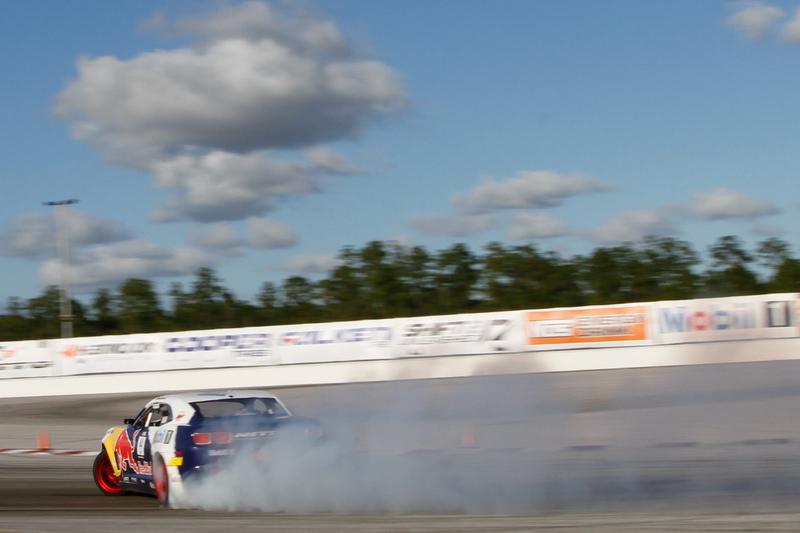 It turned out to be a Falken Tires sweep as Justin “JTP” Pawlak took the top spot. Last year’s champ, Vaughn Gittin, Jr. (above), bounced back from a loss to Road Atlanta winner Daijiro Yoshihara and not qualifying in Long Beach to 2nd place this last event. This moved him up to 10th overall in standings so far. The other Falken Tires teammate Darren McNamara took the last spot on the podium. This beautiful Monster Energy model showed support on the grid for Falken Tires / Monster Energy Ford Mustang driver Vaughn Gittin, Jr.
Otto Graven’s trunk on his massively-wide Monster Mob Nissan 350Z popped open during his battle with Vaughn Gittin, Jr in the Top 16. Graven, a rookie from South Africa, traveled to Japan where he received one-on-one training from Team Orange driver Nobushige Kumakubo. I love watching this car every time because he puts down an insane amount of smoke consistently! #1 rated European drifter Darren McNamara battles fellow Falken Tires teammate Justin “JTP” Pawlak in the Final Four. 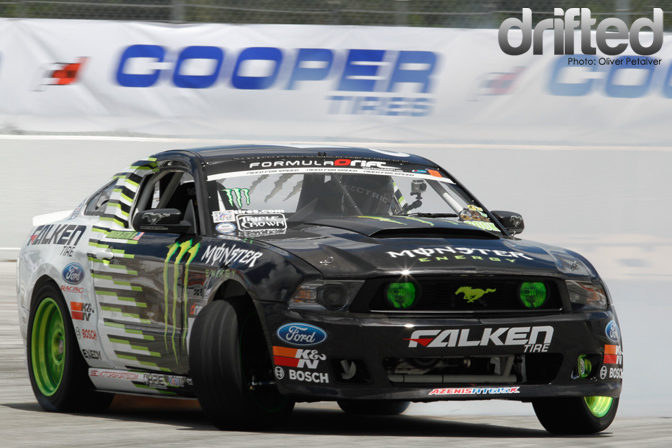 JTP defeated D-MAC and moved on to battle another Falken Tires teammate, Vaughn Gittin, Jr. The Megan Racing Team awaits clearance after battling each other in the Top 32. Matt Field, in his retina-burning yellow Nissan S14, missed his first qualifying run. Matt had fuel system issues and was unable to make qualifying. Matt and his team look forward to blaze on the track in New Jersey! Former 2007 Formula DRIFT Rookie of the Year Darren McNamara looks to be right on track to improving his 5th place 2010 finish. 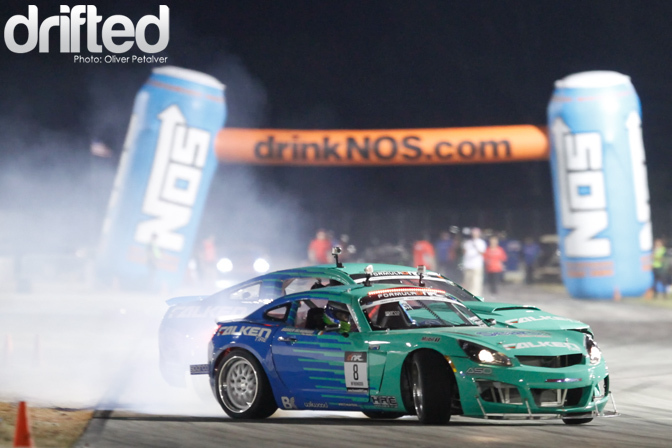 The youngest competitor in Formula DRIFT, Ryan Kado, battled Ken Gushi in the Top 32 and moved on to battle Matt Powers in the Top 16. 2009 ProDrift European champion Dean Kearney lines up his VLED/Federal Tires Dodge Viper SRT-10 before his practice run. Unfortunately for Dean, he was prevented from performing a 2nd qualifying run due to spilling power steering fluid on the track. Samuel Hubinette and his team encountered problems when a crank sensor failed. The Gardella Racing Team helped provide the part which allowed “The Crazy Swede” to practice. Hubinette eventually lost to Forsberg in the Top 16. Ryan Tuerck in his Gardella Racing/Red Bull/Mobil 1 Chevrolet Camaro battled Justin Pawlak during the Top 16. He debuted with his new, red wheels. I’m digging them so far. What do you think? 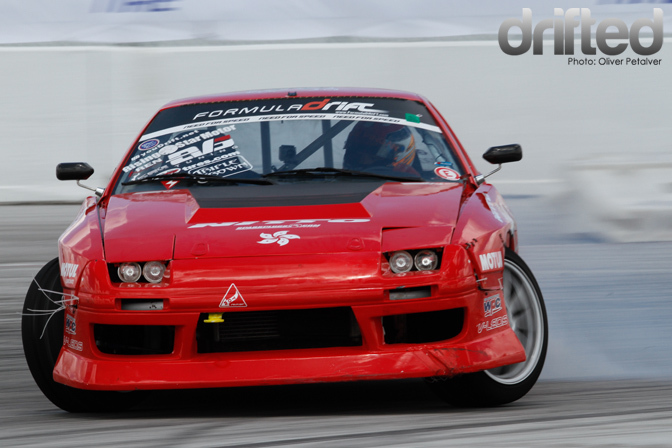 Charles Ng & his Evasive Motorsports Mazda FC RX-7 battled Tyler McQuarrie in the Top 16. Ng had great entry but it wasn’t enough as the judges picked McQuarrie. 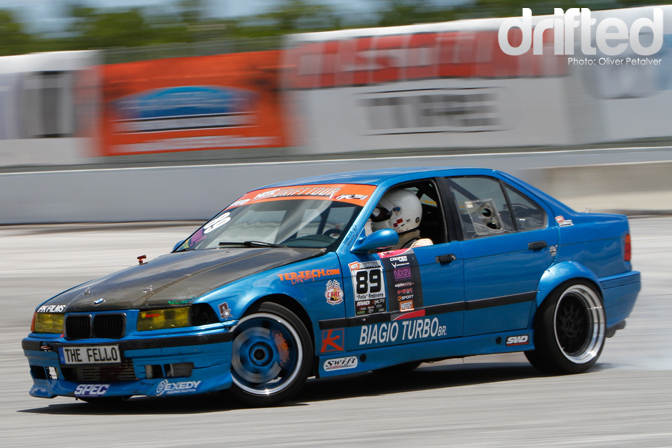 Here’s Pro/Am driver “Fello” Ambivero in his turbocharged Bimmer. 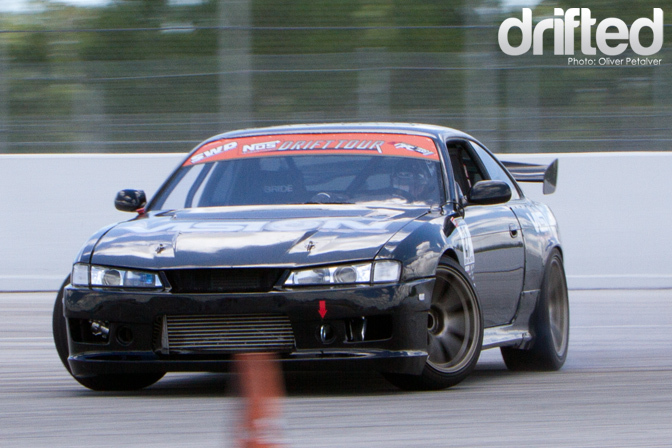 ProAm driver Ron Ewerth and his Nissan S14. 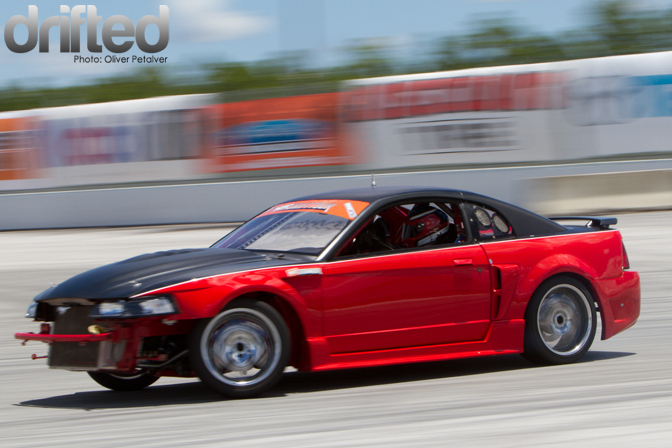 Former pro Doug Van Den Brink & his turbocharged Ford Mustang took home the trophy over the local Florida drivers. Chris “The Force” Forsberg is introduced during the Top 16 ceremonies. He’s currently in 4th in overall standings with 215 points. A Falken Tires model shows support for Darren “D-MAC” McNamara in his Saturn Sky. The models in bikinis perfectly complement Florida’s lovely, warm weather don’t ya think? Another model that caught the attention of many eyes was Hankook Tires model Nicole-Marie Reckers. Hankook definitely knows how to choose their models! 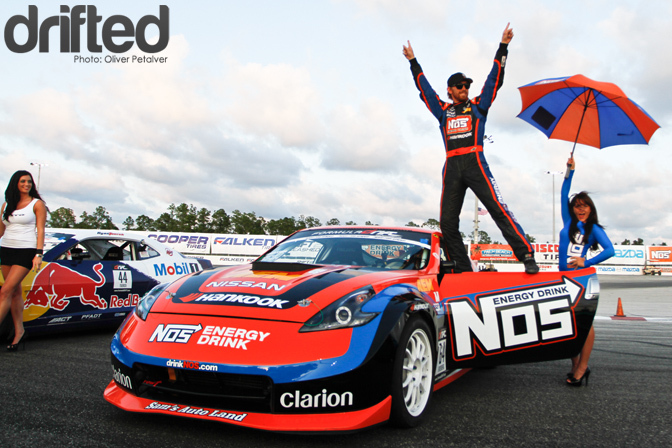 Chris “The Force” Forsberg, who pilots the NOS Energy Drink Nissan 370Z, had reason to be all smiles: He qualified in the top spot with 93.3! Drifted’s very own Dan Cyr shows us how to get close to the NOS Energy Drink models–by dressing in the same colors and blending in! So far, this year’s Formula DRIFT Pro Championship looks to be a close one with less than 50 points between the top five competitors. The competition continues on the East Coast at Wall Speedway in New Jersey on June 17-18. For more information, visit www.formulad.com and purchase your tickets ahead of time!